So, say you’ve inherited a large stack of family photographs showing ancestors who are far up your family tree – such as great-grandparents, or their siblings, cousins, or close family friends. As you stare into the moment in time captured in that cabinet card or tin type photograph, do you ever wonder what their voices sounded like, or what sort of accent they spoke with? Do you wonder what words they chose when they spoke? Or what perspective they brought to their life experiences? Or even what activities filled a day in their lives? In some very rare cases, a home movie might surface, allowing you a glimpse of your ancestors (or someone else’s) living through some long-ago day. For most of us, though, home movies from that far back just don’t exist (and likely never existed). But, if we’re looking to learn more about the faces in our old photographs, we might be able to rely on letters that have survived through the decades. Letters provide a sense of immediacy, a glimpse into a moment or day otherwise completely lost to living memory – and it’s all captured in the yellowed pages that you hold in your hands. I was fortunate to marry into a family who saved . . . everything – photographs, family bibles, letters, journals, Christmas cards, insurance bills . . . and, yes, even old tissues – you know, the ones from long ago that came in shades of hot pink and cool blue. I’m not sure when those came off the market, but it’s been some time. I view these as a testament to how dedicated they were in saving just about everything for posterity. The photographs and family bibles are great, but the letters really go the furthest when I try to flesh out the names, dates, faces, and personalities that have emerged on that side of the family. Letters can tell you a lot about what words and expressions ancestors used when they spoke, how they pronounced them, what an average day was like for them, and what perspective they brought to their everyday lives. The Hamlett Family posed for this photograph several years after the 1899 letter was written. Frank is the older man standing in back, at left. Mae stands to the immediate left of her brother, in the photograph's center. Among the many letters I’ve come across in my in-laws’ collection of family artifacts, was the one below, written in the first days of 1899, by an 11-year-old girl to her father, who was, quite literally, a traveling preacher. Tessie Mae Hamlett (‘Mae’ to the family) was the second-oldest daughter of the four children of William Franklin Hamlett and his wife, Samantha Ann (Peck) Hamlett. When the letter was written, the family lived in Americus, Indiana, a small town near Lafayette, Indiana. 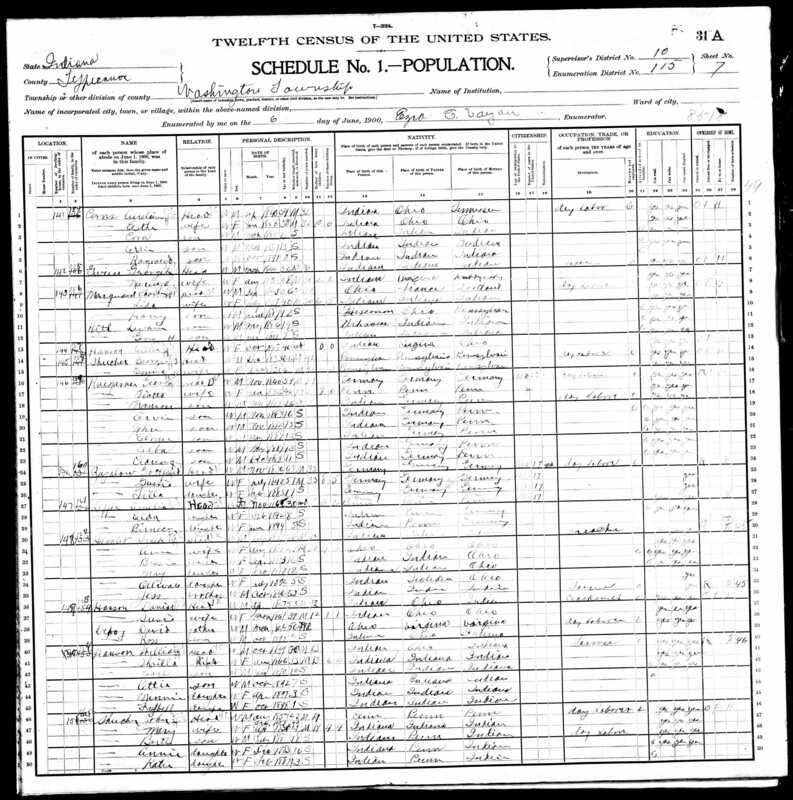 The attached page from the 1900 US Federal Census shows the family, just 17 months later, in June 1900. Frank Hamlett, as he’s come to be known by his descendants, was a preacher in his mid-40’s at the time of the letter. Mae, just a few days past her 11th birthday, wrote the letter below that reached him at some location whose name has been lost to history. 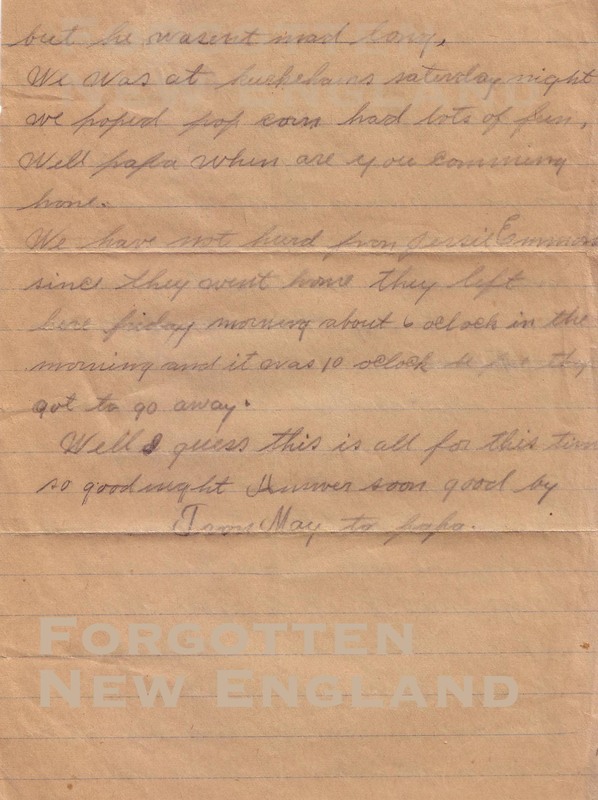 Below, I’ve attached the front and back of the letter, as well as a transcription. I thought I would write to you this evening to let you know that we are as well as usual and hope this may find you the same. George and Ann was up to day. Aunt Susie is sick. She has got a swelling on her hip. They butchered to day that little pig. It weighed 125 pounds when it was dressed. Bessie got a letter from Bennie Pepper to day. He got home all right. George said to tell you that he got a letter from worth judgement to day. Bessie is making her a apron and manson is fixing her shoes. Manson got mad at Bessie on Saturday but he wasn’t mad long. We was at Kurkehains saturday night. We popped pop corn, had lots of fun. Well, papa, when are you coming home? Tessie Mae closes the January 1899 letter on Page 2. Well, I guess this is all for this time so good night, answer soon, good by. Letters, sometimes tucked in with stacks of photographs inherited from older family members, or pressed within the pages of yellowed family bibles, provide valuable insight into the lives of ancestors and help us understand them as whole people, and not just sets of names and dates. After reading some of our Hamlett family letters, I began to get a sense of what their voices sounded like, the accent they might have spoken with, and what words they used when they spoke. It’s not as telling as a video or a face-to-face interview, but with the upper branches of a family tree, letters may be one of the best available and sometimes most overlooked resources. Readers, have you come across some interesting family letters from long ago? Did they help you learn some interesting facts about your ancestors? I found letters in the early 1900’s from my grandmother (who I never knew) she died in 1924 in a polio epidemic. It was great to get a chance to see her as a person and see also how her thought patterns worked. She was writing to my mother (her only daughter). So precious. Hello – and thanks for the comment. 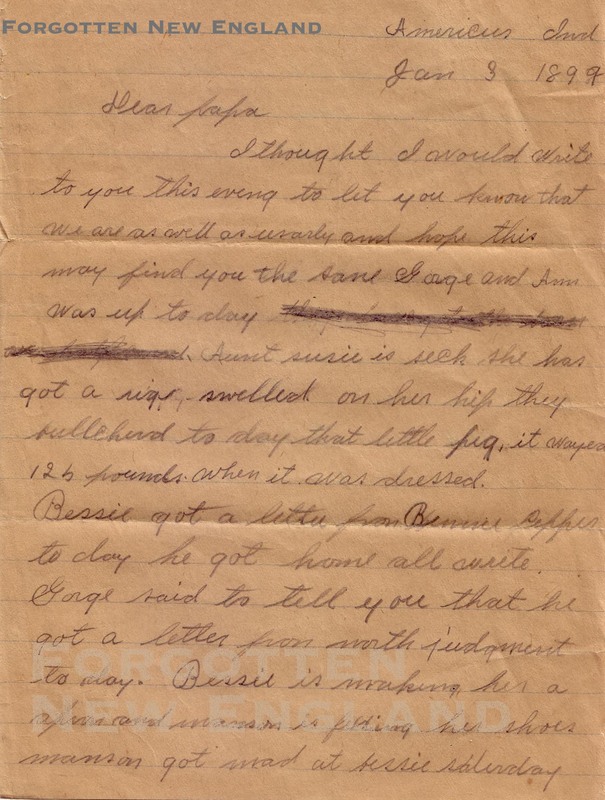 I came across another letter, from WWII, where my wife’s grandfather had kept a set of letters sent to him from his mother while he was serving in the military overseas during the War. The pack of letters were all clustered around a short time in 1944. I later found out that his mother had died suddenly while he was away at war. I now think that those were the letters he had when the news reached him. At any rate, the letters provide some great insight into who she was and how she thought; since she died in 1944 and he died in 1995, they are really the only window we have into who she was as a person, beyond the photographs and vital/census records she left behind. Hi Mary Ellen, I feel like school records are a relatively unexplored area of family tree research, but they can provide some great insight into the childhood/early years of family members. A few years ago, in a stack of photographs, I found some grade school report cards from the late 1910’s/early 1920’s; besides providing grades, the commentaries from the teachers were great. It turned out that Aunt Marge was kind of a chatterbox even in sixth grade too. A lot of historical societies/local research centers will have old school records, but as far as which schools/years they have, it’s kind of hit-or-miss. I’d recommend calling a few research centers in the area of those schools. If they don’t have the records, they might know who will. Another possibility for student records for schools that have closed is that they’ve been rolled into another nearby school. For Kents Hill, which is still open, they might still have records and be willing to share them with a descendant of the student. It’ll depend on their policy. Ancestry.com has a collection called “U.S. School Yearbooks” – which has yearbooks for (mostly) high schools and colleges located within the US. I’ve found a few cousins in them, from as far back as 1928. I looked for yearbooks for the two towns you mentioned, but didn’t find anything. One of the most promising, free leads might be a “Google books” search. I did a quick search on Google Books for – “Kents Hill” Maine – and got about 1500 hits in free Google e-books. Thanks for the comment – and good luck! The part of this letter that resolnated with me was that they popped corn. I once read the entire 1969 journal of Bessie’s husband and he ate popcorn. Popcorn is my biggest food weakness and as their great-grand-daughter and the girl that lives in the house Bessie and her husband built, I feel especially connected to that statement. I’m finding that the Hamletts were somewhat prolific letter writers. In that same collection of letters, there’s another, to Bessie, dating from 1903, written partially in a pig-latin type of code and signed “from the one who has found you worthy of his love”. I’m told that the letter was not from her husband, but actually from another man she had dated before him. Those Hamletts were good at saving letters! The “pig latin” letter would’ve made a good post too, but transcribing an 8 page letter was a little more than I was planning to do for a mid-week post! Ryan, it’s funny, I’ve been thinking about how nice it would be to have some letters written by ancestors– those who are fortunate enough to have some really have a treasure, for these provide great insight into their personalities and lives. 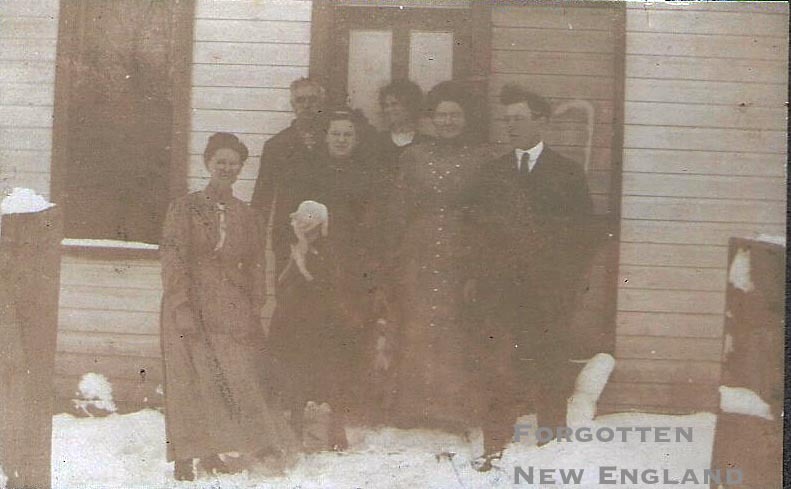 Hi Mary Ellen – the town hall in Eaton, NH will likely have the birth record for your second-great-grandmother that should include the full names of her parents (and maybe a place of birth). The further back you go, the sparser the records get with details. I did a quick search on Ancestry and found a Parker Spaulding, born abt. 1801, and wife Elizabeth Spaulding, born abt. 1805, living in Belgrade, Maine at the time of the 1860 census. They had two children living with them in 1860: 20-year-old Marah and 17-year-old Jesse. It looks like this Parker Spaulding was born in Mass; Elizabeth’s place of birth is listed as New Hampshire. That could be them, if they moved on from Eaton, NH at some point after they married. I was also lucky enough to get letters that had been kept by my Grandmother and also her sister when they passed away. If I had not taken them they would have been destroyed. Most of the letters are from the last 30 years, but some go back to the 1930s. They also saved invitations along with the thank you notes, newspaper clippings, etc that they put in the envelope with the invitation. Unfortunately, I live in a small house and just couldn’t keep them all so I threw out all cards that just had signatures and scanned everything else. It has taken me several years to get them all scanned but at least we can still read them. I also made DVDs and gave to one to everyone who had written them. I was also able to return some items to families of the original writers/owners by finding them on Ancestry.com. I kept a few original letters from each of the writers and tossed the rest. I have already scanned about 5,000 letters and may find more as I go through more items from my family. I haven’t started scanning the invitations except for one that was from 1938 – a high school graduation invitation – and was able to return to their family.